Good morning, its Friday, Friday, Friday and today I'm over at Stylin' Stampin' INKspiration, where we are sharing holiday "Thank You" cards. I've been playing with this color combination for the couple of weeks and its become quite a favorite that I decided to use it again. 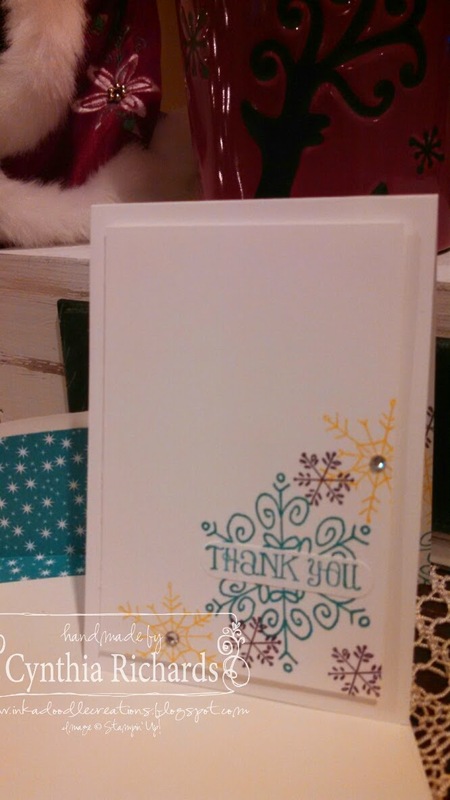 I think the three colors create such fun for this snowflake thank you card. This design can be created so quickly that you could easily whip out 4-6 and insert them into an envelope and give as a small gift to any teacher as they are always sending thank you cards. This thank you card measures 3-1/2" x 5", with a layer of 3" x 4-1/2". One thing that you will be seeing a lot of from me as well, is me using up some DSP for creating fun inserts for my plain old boring envelopes! I am in love with this die set and don't understand why I haven't been using them more often!! I hope you have enjoyed my quick and easy thank you card that it inkspires you to go create some yourself!